In this day and age when there’s so much negativity in the world and media, it’s nice to hear an uplifting story every now and then. The couple tried looking for the car themselves, but eventually ended up settling with the insurance company and Rex didn’t think he’s ever see his prized Stingray again. 44 years later, he was shocked to receive a call from the Ohio State Police letting him know that they had just found his 1969 Corvette in Cleveland. At first, Rex refused to believe the Ohio State Police until he saw the Corvette for himself. “I guess I didn’t believe them until I actually took a trip over there and seen them,” he said. Rex had to endure some back and forth communication with his insurance company and had to dig through his records to find proof of ownership, but shortly after, he was finally reunited with his pride and joy. “It feels like I am a young kid again. For five minutes till I start getting out then I won’t be young anymore,” Rex said as he sat behind the steering wheel. 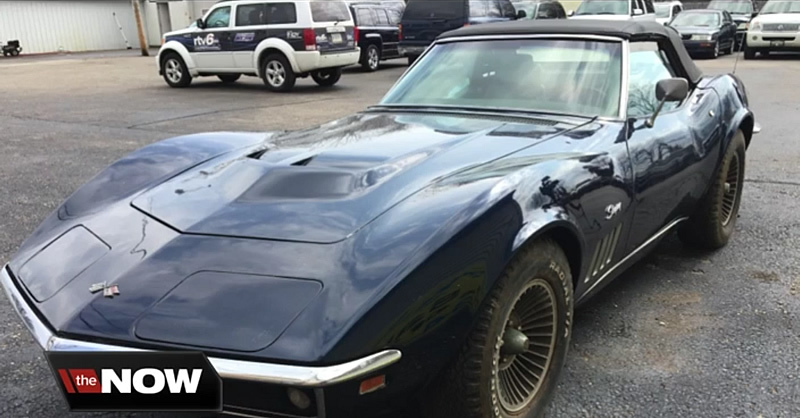 Indianapolis man’s stolen Corvette recovered after 44 years. The 1969 Corvette had been repainted a midnight blue color and the interior is showing signs of wear for its age, but Rex has plans to gradually restore it back to its original condition. Congratulations Rex and start making up for all of those lost years with your pride and joy!